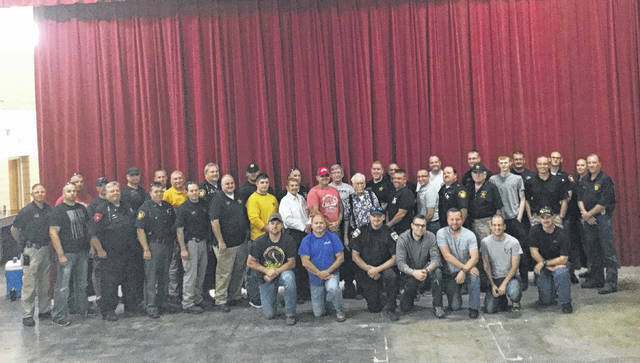 Agencies represented at training on Sept. 26 were Middleport Police Department, Meigs County Sheriff’s Office, Gallia County Sheriff’s Office, Syracuse Police Department, Racine Police Department, Pomeroy Police Department, Rutland Police Department, Coolville Police Department, and Ohio BCI. MIDDLEPORT — Forty law enforcement officers from nine agencies took part in eight-hours of Continuing Professional Training (CPT) on Thursday at the Middleport Police Department. A news release from Middleport Police Chief Bruce Swift and Meigs County Sheriff Keith Wood states that Ohio law requires that each year all OPOTA certified law enforcement officers complete required continuing professional training to be able stay certified by the Ohio Peace Officer Training Academy. The required training hours and subjects are determined by the Attorney General’s Office and the Ohio Peace Officer Training Academy. In 2017, there are 20 hours of required CPT and the number rises to 40 required hours in 2018. Another training session will be held at Middleport Police Department on Oct. 12. These training sessions are open to any OPOTA certified Peace Officer. Swift and Wood believe that by working together and offering these training sessions many area law enforcement agencies and officers will be able to receive the required training and be better prepared to serve their communities. https://www.mydailytribune.com/wp-content/uploads/sites/42/2017/09/web1_training-september-26th-2017201792913593363.jpgAgencies represented at training on Sept. 26 were Middleport Police Department, Meigs County Sheriff’s Office, Gallia County Sheriff’s Office, Syracuse Police Department, Racine Police Department, Pomeroy Police Department, Rutland Police Department, Coolville Police Department, and Ohio BCI.